Mooncakes. What's the first thing that makes you go "Wow!" about them? It's the gorgeous box and packaging! That's what makes the first impression. Some hotels go to great lengths to make showstopping designs, because it really adds a differentiating factor. And long after the mooncakes have been savoured, the treasure chest boxes remain as a lovely souvenir. They can be re-used as storage for trinkets, accessories, stationery, jewelry, cosmetics, timepieces and even small toys. The classic baked mooncakes come in these brightly coloured boxes so intricately adorned with painted orchids. 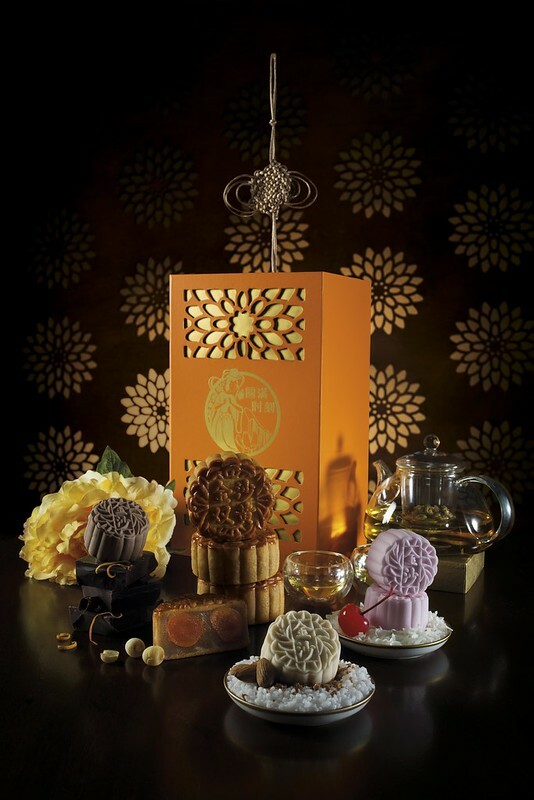 The chocolate series of mooncakes have their own box (as seen on the brochure). Marina Bay Sands has always had the lantern themed mooncake boxes. A magnetic clasp opens up the tower of spacious drawers where you can store your favourite things. While @dtccsg has commissioned a special #mooncake box featuring art from La Salle students, it's the #bright #aqua carrier that's really eye-catching. Baked traditional mooncakes include - D’Classic with egg yolk blend ($65) and D’Classic with Melon seeds ($55), both with smooth premium white lotus paste filling. The Grandeur Mini #Snowskin ($60+) series includes the all-new decadent Creme de Oreo®, filled with creamy cheese and Oreo® cookie crumble; Yuki Kuro Goma; Osmanthus Yuzu and the Choco Hazelnut. The Royal Elixir Mini Snowkin ($65+) series features Earl Grey Kirsch, Caramello Whiskey Truffle, the Rum “V” Raisin and the signature Baileys Amore®. 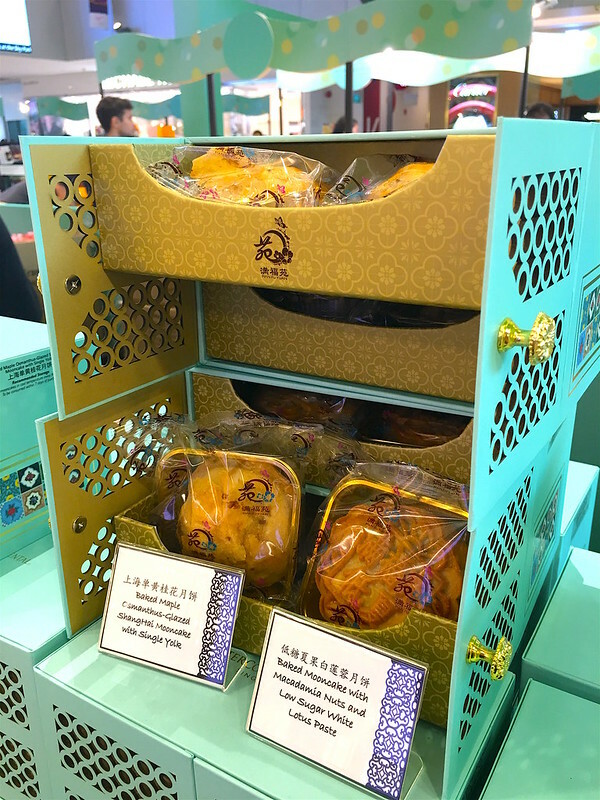 I love the bright aqua carrier bag; it makes presenting the mooncakes so much more elegant. Inside is a box with local scenes done by La Salle students. The @fairmontsingapore #SzechuanCourt has #charming #Mooncake #Boxes with #cheongsam flaps. The mini #snowskin #mooncakes are also #delicious, especially the #Yuzu #Chocolate #Crunchy #Pearl one. Early bird discount of 30% for online orders 25 July to 7 Aug (www.celebrationscentral.com.sg). Available at the Mooncake booth level 2 #Fairmont #Singapore from 8 Aug to 15 Sep.
OK this is what the boxes look like, before the artistic filter. The boxes are very sturdy and lined with a silk-like fabric with a sweet cheongsam motif. Available in either a tower of drawers or a partitioned tray. Man Fu Yuan's mooncakes this year come in a lovely teal box with peek-a-boo doors. Little Peranakan tiles decorate the side of the box, while drawers slide out to reveal the goodies. Yan Ting always has nice boxes too. 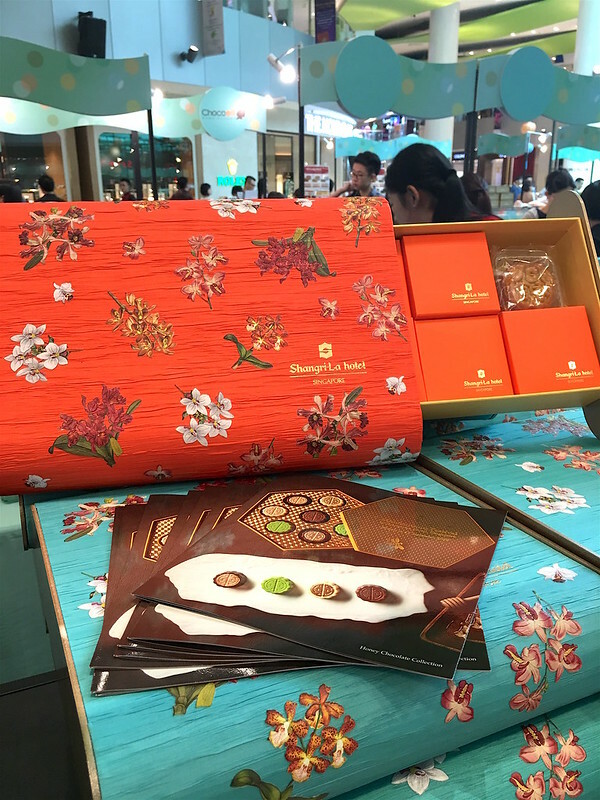 This year they coddle the mooncakes in gloriously orange padded leatherette boxes lined with suede. Check out the website for photos of the deep box too. Some interesting snowskin flavours to watch out for too. This beautiful limited edition box will speak to tea lovers! Made from eco-friendly bamboo, it features a carved cover that also serves as a tray for tea appreciation. The tea-flavoured mooncakes are visible inside through the embellished motif cut-outs. 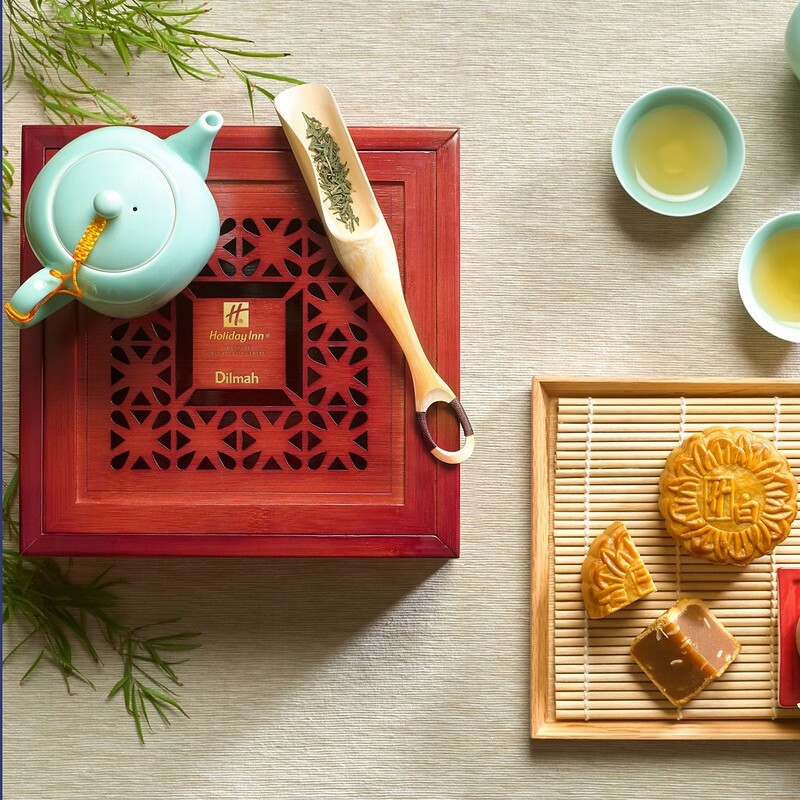 The mooncakes come with two Dilmah t-Series tea flavours – Tie Guan Yin Fragrant Oolong and Sencha Green Extra Special. I have to admit, I just really like the logo for Antoinette. And Chef Pang has come up with some trendy molten lava mooncakes to boot. The snowskin mooncakes come with a creamy truffle-centre that can be eaten cold, or warmed up in the microwave to reveal a luscious oozing centre. This year @crystaljadesg has four new mini snowskin #mooncakes (L-R): chlorella with melon seeds; blueberry with cashew nuts; white lotus paste with macadamia; and lychee with pine nuts. 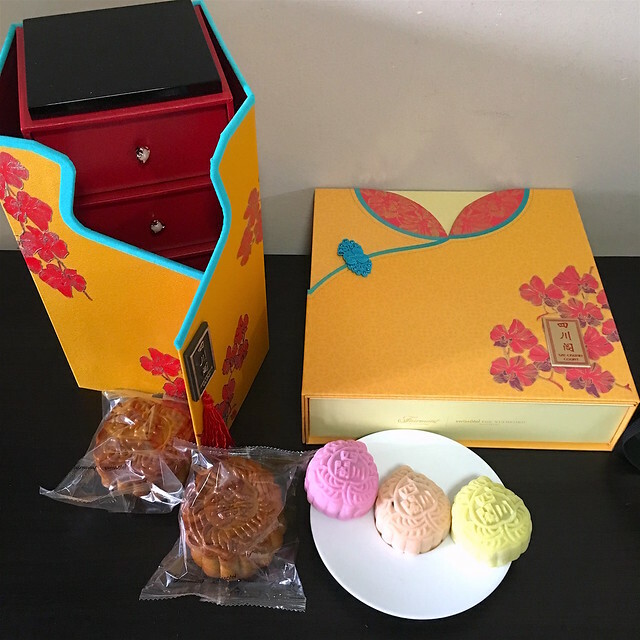 The traditional baked mooncakes with white lotus paste have gone low sugar (one of the best-tasting ones) and the signature Mixed Nuts with Jinhua Ham is beautifully nuanced with olives, almonds and sesame. The peony themed box is simple but pretty. Will come in useful as storage for trinkets or stationery. Crystal Jade had some nice boxes in the past, like a faux leather, suede-lined treasure chest or jewel-coloured acrylic boxes. This year they've gone simple. But I like this one particularly because it's compact and vertical; it won't hog a lot of space. The magnetic flip-top cover and a pull-out drawer makes it easy to access the stored items. Their low sugar mooncakes are one of the best tasting ones around too. 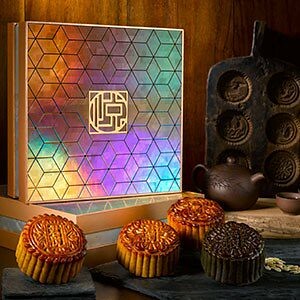 Their handmade mooncakes are presented in a geometric patterned box featuring mother of pearl textures gilded with accents of rich rose gold. Oh the mesmerising iridescence! What mooncakes will you be getting this year? I'm sure there are some stunning ones I have missed out; let me know! P.S. 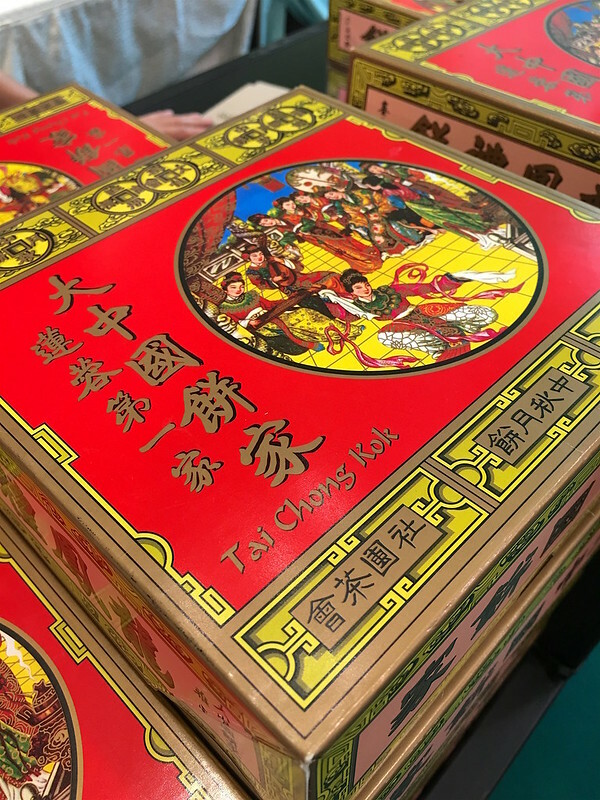 Although they don't have a fancy box, I still like the old-school packaging of the Tai Chong Kok mooncakes.